Tokyo, Japan. Religions for Peace through its International Standing Commission on Disarmament and Security and Religions for Peace Japan co-hosted the Special Session entitled “Our Shared Moral and Legal Obligations to Eliminate Nuclear Weapons: On the Occasion of the 20th Anniversary of the Advisory Opinion of the International Court of Justice (ICJ) on the Legality of the Threat or Use of Nuclear Weapons” on August 2 and 3, 2016 at the United Nations’ University. 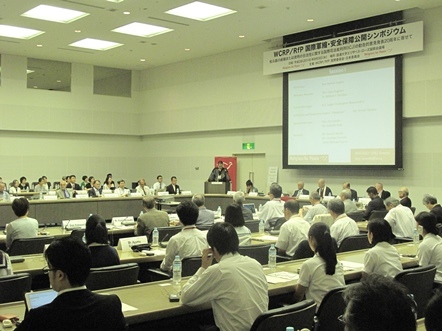 Around 100 religious leaders, parliamentarians, diplomats, scholars and civil society leaders from 11 countries as well as Hibakusha (survivors of nuclear bombing in Hiroshima and Nagasaki) and high school students representing the younger generation gathered with the conviction that nuclear weapons should be abolished as soon as possible. The first day was the business session. The RfP Standing Commission conducted, where more than 50 representatives from religious communities, civil society organizations, parliamentarians, scholars, diplomatic leaders, an intensive discussion on issues and action programs related to the elimination of nuclear weapons. The open Symposium was convened the next day with the participation of around 100 local community leaders including high school students. 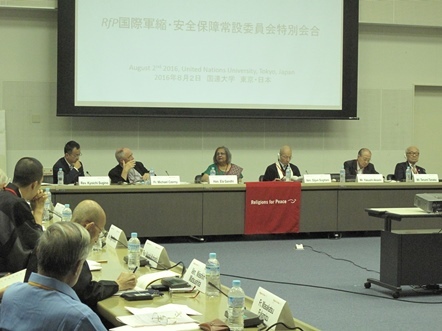 It should be noted that five high school students made their presentations on the podium, expressing their earnest longing for the elimination of nuclear weapons, which was followed by the comments from experts. This session symbolized that today’s generation would bear its responsibility in achieving a nuclear weapon-free world for humankinds for the generations to come. Please click here for the speeches delivered at the symposium.